One of Venezuela's main opposition leaders, Leopoldo Lopez, has appeared in court in the capital, Caracas. Mr Lopez is accused of inciting violence during anti-government demonstrations earlier this year. He has been in custody since 18 February, when he handed himself in to the authorities. He denies all the charges. Dozens of people gathered outside the courthouse to demand his release. They carried banners showing Mr Lopez and reading, in Spanish, "Wanting a better Venezuela is not a crime", "Let's free Venezuela", and "Fighting for your rights is not a crime". 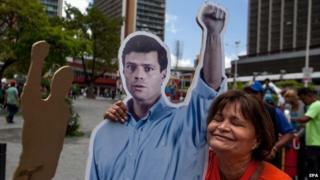 The demonstrators chanted "Release Leopoldo!" and "No to dictatorship!". Mr Lopez, who is the head of the Popular Will Party, has accused the government of President Nicolas Maduro of jailing Venezuelans for seeking democratic change. During Wednesday's session, prosecutors were expected to present more evidence against the opposition leader. Other opposition activists detained during the protests earlier this year have also appeared in court in Caracas. The street protests began in late January, in the western states of Tachira and Merida. Opposition leaders seized the moment and called for a big anti-government march in Caracas a few weeks later, on 12 February. Mr Lopez was among the most active leaders. He founded a movement to advocate a change of government using the hashtag #lasalida, which in Spanish means both "the exit" and "the solution". The government urged its supporters to take to the streets on the same day, in a rival march. Three people died in incidents at the end of the marches. The authorities accused Mr Lopez of inciting violence and encouraging demonstrators to vandalise government buildings.